This 3 bedroom villa with private pool is located in Costa de Papagayo and sleeps 6 people. It has WiFi, air conditioning and barbeque facilities. This 2 bedroom villa with private pool is located in Costa de Papagayo and sleeps 4 people. It has WiFi, air conditioning and barbeque facilities. This three bedroom semi-detached villa is located in a quiet cul-de-sac in Playa Blanca. Just a fifteen minute walk from the Playa Dorada beach and the resort amenities. This 2-bedroom villa for up to 4 guests is located in Playa Blanca and has a private swimming pool. This villa with private pool is located in Costa de Papagayo and sleeps 6 people. It has WiFi and barbeque facilities. 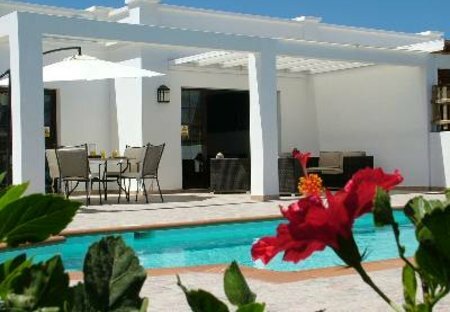 This 3-bedroom villa for up to 6 guests is located in Playa Blanca and has a private swimming pool. Set in a quiet cul-de-sac in the Costa Papagayo area of Playa Blanca Villa De Fuera is a peaceful 3 bedroom villa which is in close proximity of Playa Dorada beach and several amenities. 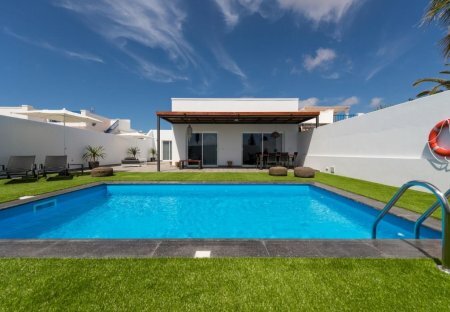 This 3 bedroom villa with swimming pool is located in Costa de Papagayo and sleeps 6 people. It has WiFi, parking nearby and air conditioning. Situated in Lanzarote's south, Yaiza's coastal region Costa de Papagayo and Los Ajaches Natural Park is home to some of the most popular beaches on the island. The surrounding district of Yaiza boasts some of the most striking landscapes in Spain, with a backdrop of volcanic mountains that make up Timanfaya National Park. Perfect for families and outdoor lovers, enjoy a Canarian coastal break brimming with water sports, adventure, excellent food and natural wonders. Papagayo beach is a firm favourite, with its horseshoe-shaped cove of fine golden sand and crystal-clear, calm waters, but you might also want to try Playa Blanca and Puerto Calero for a livelier atmosphere and a wide choice of restaurants and seafront cafes. This region is also ideal for coastal walks, with a scenic route connecting Playa del Afre with the beaches of Costa de Papagayo from Mujeres beach. Sit and watch the world go by at Marina Rubicon between ilos Ajaches and Playa Blancas, with plenty of upscale shops and bars, or enjoy a local cocktail at neighbouring Puerto del Carmen. For wine lovers, a tour around Bodegas Rubicon in Yaiza is a must. A direct flight from the UK to Lanzarote's Arrecife Airport takes 4 hours, with a less than 20 minute drive to Yaiza. August is the hottest month with an average high of 29°C. Yaiza is perfect for winter escapes too, with an average high of 21°C in December. Take a camel ride around Timanfaya National Park, Lanzarote’s top tourist attraction, home to the stunning 'Fire Mountains'. Water taxis are an excellent way to get from one beach to another, as well as neighbouring resorts. Yaiza was devastated by volcanic eruptions in 1730 and 1736, leaving behind a breathtaking landscape that has won prizes for its beauty.